Rush Elmore was an associate justice of the Kansas Territory's supreme court, a leading delegate at the Lecompton Constitutional Convention, and a slave holder. 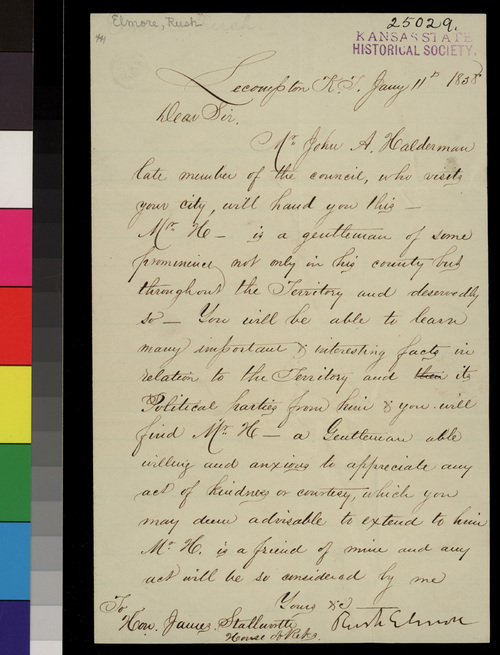 He writes this letter of introduction, from Lecompton, Kansas Territory, for John Halderman to "hand" to the Hon. James A. Stallworth, who was a member of the U.S. House of Representatives from Elmore's home state of Alabama. Halderman is, apparently, making a trip to Washington, D.C., and Elmore asks Congressman Stallworth to show Halderman every courtesy. Elmore calls his "friend" Halderman "a gentleman of some prominence not only in his county but throughout the Territory," and writes "You will be able to learn many important & interesting facts in relation to the Territory and its Political parties from him."